Fred D. Durrah, 84, a private-practice real estate lawyer who formerly worked in the legal counsel office of the Labor Department and other government agencies, died April 27, 2000, at his home in Washington after a heart attack. Mr. Durrah was born in Plainfield, New Jersey. He was a graduate of Howard University and Rutgers University school of law. He served in the Army during World War II and later in the Army Reserve. He came to Washington in 1964, and for a time commuted to New Jersey, where he was an Assistant U.S. attorney. He spent about seven years with the Labor Department, five years as deputy general counsel in the office of Secretary of Transportation, and four years with General Services Administration agencies. In 1979, he opened a private practice in Washington and established the real estate firm Integrity Realty, which he continued to manage until his death. He was a member of bar associations and the National Association of Real Estate Brokers. He also belonged to the Alpha Omega chapter of the Omega Psi Phi social fraternity, the Kiwanis Club of Capitol Hill, the Pig Skinners and St. Mary's Episcopal Church in Washington. His wife, Isabeele Durrah, died in 1988. 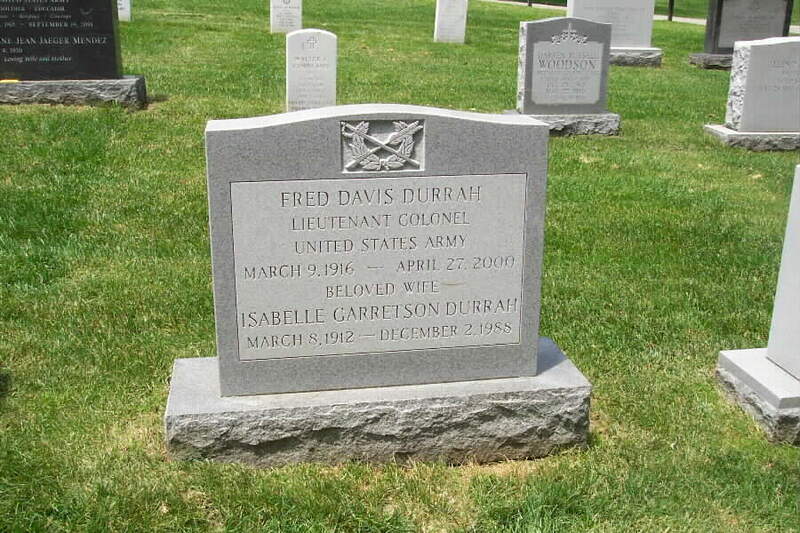 Colonel Durrah and his wife are buried in Section 7-A of Arlington National Cemetery.